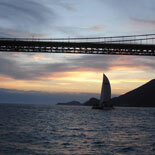 Want to see the San Francisco Bay as the sun sets over the Pacific Ocean? 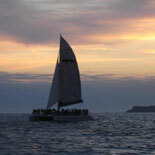 Our 1.5 hour Sunset Sail is for those who want a serene, romantic experience. It's the perfect date night! Watch the city slowly light up behind you as the Golden Gate Bridge glows in the dwindling sunlight. You will sail from Pier 39, around Alcatraz Island, under the Golden Gate Bridge & back down the San Francisco City Skyline. Relax and sip some California wine in our protected cabin with intimate tables and cushy seating. Included with your ticket are two complimentary beverages (beer, wine or soda) from the bar and light hors d'oeuvres. 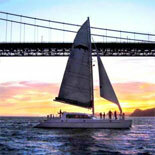 For a memorable night out that won't break the bank, make your reservation and get your eTickets for the San Francisco Sunset Sail! Arrive 30 min early to find parking and to locate departure point. Pier 39 Dock J San Francisco, CA. 94133. Gate J, next to the Sea Lions. Price the same regardless of age. Directions from Pier 39 to Adventure Cat Sailing Charters: When you get to Pier 39, stand on the sidewalk & look toward the water, do NOT go down the center where the shops are, but take the left OUTSIDE walkway. Go toward the sea lions & look for a gate with the letter J on it. That's the dock.